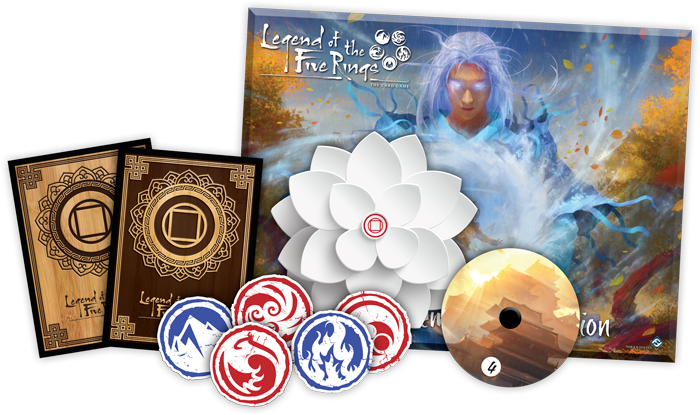 Elemental Championships are special tournaments for Legend of the Five Rings: The Card Game that run at select retailers and offer new shape to the world of Rokugan and the conflicts between its Great Clans. New tensions between the clans threaten to unravel the Emerald Empire. The Crane and the Lion find themselves on the brink of war. The Phoenix are concerned by the Unicorn’s use of meishōdō magic, which they see as heretical. The Crab seek jade to ward against the Shadowlands and its taint. And, behind the scenes, the Scorpion continue with their schemes. But these events may only be obscuring a greater danger—one that threatens the whole of Rokugan. The elements have fallen out of balance, though few fully understand the signs. Famine. A tsunami. The kami are restless, and shugenja claim they are increasingly unreliable. Even while they offer players the opportunity to gather for exciting, high-level tournament play, Elemental Championships represent a chance for the samurai of Legend of the Five Rings: The Card Game to reshape their clans' connections to the kami and the elemental rings of Air, Earth, Fire, Water, and Void. There's more than personal and clan glory at stake at these events. More than the range of exclusive prizes. There are two phases of Elemental Championships each year, and they play an integral role in Legend of the Five Rings Organized Play. Players at these tournaments help determine which elemental roles their clans will be able to use in the coming months, and the winners of each Elemental Championship will reserve their seats at the following Winter Court World Championship! View the prizes for the 2019 Phase One Elemental Championships. Find an Elemental Championship near you. 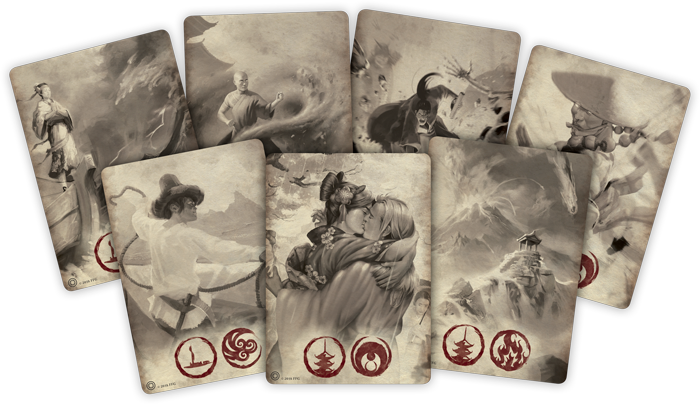 The Elemental Challenges for Legend of the Five Rings: The Card Game run primarily at conventions and similar events. Like the Elemental Championships, they feature their own set of custom prizes, and they challenge samurai to pursue new relations with the elements and the kami. The Elemental Challenges, however, are smaller than the Elemental Championships. They run for a set number of Swiss rounds and function like a training ground for the larger Elemental Championships. Indeed, they even feed into those tournaments as the undefeated players at each Elemental Challenge, in addition to their other prizes, each receive a prize bye that they can redeem at a future Elemental Championship. View the prizes for the 2019 Elemental Challenges. Find an Elemental Challenge near you. 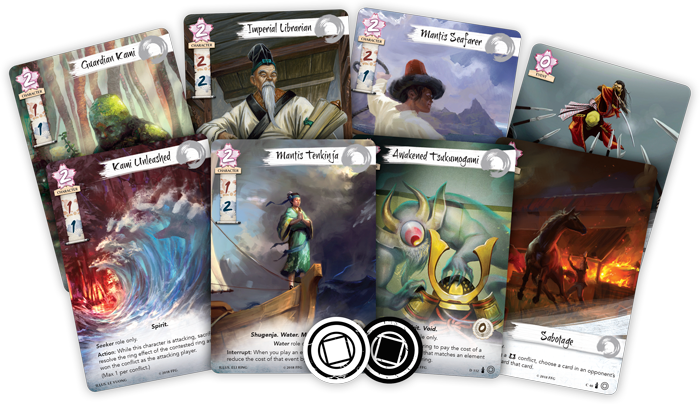 In Legend of the Five Rings: The Card Game, your clan's elemental role dramatically impacts the deckbuilding options available to you, and the Elemental Championships play a critical role in determining which roles are available to each of the Great Clans. New roles are selected three times per year—at the Winter Court World Championship in November, after the first phase of Elemental Championships ends in March, and after the second phase of Elemental Championships ends in July. The implementation of these elemental roles is staggered so that each is in effect for eight months. The roles take effect at the beginning of January, May, and September. No clan may select the same elemental role twice. Each clan will always have two available elemental roles. The elemental roles chosen at the Winter Court World Champion will be drafted by each clan's top finisher in the event. Each clan will first gain access to a second elemental role at the conclusion of the Toshi Ranbo Season Kotei Series. The last event is scheduled to take place at Gen Con Indy 2018. This "Kotei Role" will remain in effect until the conclusion of the first phase of 2019 Elemental Championships. The fact that the Elemental Championships introduce rotation to your clan's elemental roles means that you and your clan will have more deckbuilding options. Those options will change on a regular basis, and you will be able to explore a new metagame every four months.